The Hotel Is situated in the center of Tel-Aviv business and entertainment area and just 150 meters from the Beach. The Hotel is the newest addition to the Jerusalem Tower Hotels chain and meets the high standard required by both business and leisure guests.Rooms are equipped with interactive T.V. which allows access to the Internet and movie rental.Connections for personal computers are provided. For guests convenience a mini bar and coffee making facilities are available & a sea-view sun deck. All public areas are tastefully decorated and furnished, including the conference room that seats between 15-30 people. The hotel offers 70 rooms furnished to the highest level and offering up to date technology. In every room an ADSL Internet connection is available, together with interactive television and pay videos. A remote controlled keyboard is available to enable surfing the Internet via the television. Coffee making facilities, and personal room safe all can be found in the rooms. The safe is designed to hold personal computers. 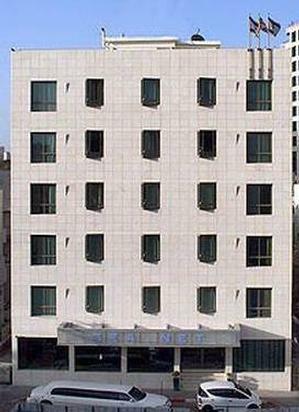 The Hotel is located on the corner of Nes Ziona and Hayarkon Street . "A good hotel to remember for next time..."